VERY considerable number of ancient baptismal fonts still remain within the walls of the ruined churches of Ireland, and others are found in graveyards where churches, of which no vestige remains, formerly stood. The fonts usually found in connexion with the more ancient churches are extremely rude, and of small dimensions, being rarely large enough to allow of the immersion of infants. They are in almost every instance formed of a single stone clumsily hollowed, and having a hole at the bottom of the basin; but in some examples no mode of escape for the water appears. 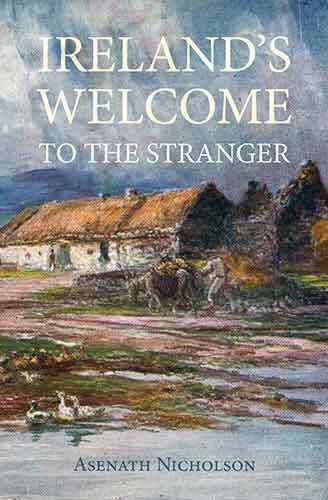 An extremely early font occurs in the ancient church of Killiney, described in page 66, and there is another in the equally ancient church of Kilternan, in the county of Dublin. An example in which there is no passage by which the water can be allowed to escape, may be seen in the church of Saint John's Point, County Down. The earliest fonts are generally somewhat circular in form, but the stone appears only to have been roughly hammered, and in no instance have we perceived any attempt at ornament. Perhaps the oldest ornamented font remaining in Ireland is that which stands in the graveyard of Killeshin. It is of a bulbous form, and the base is cut into an octagon figure. After the twelfth century fonts of greater size, and supported by a short column, appear to have become common. Their form is generally octagonal, but they are seldom ornamented in any way, and when ornaments occur, they consist only of a few mouldings upon the shaft, or upon the upper edge of the basin. From the absence of mouldings in the majority of instances, it is extremely difficult to assign a date to the numerous fonts of an octagon form which remain in many parts of the country. During the period of debased Gothic architecture, a great many appear to have been erected in Ireland, particularly in the district comprising the old English Pale. We have engraved an unusually fine example from the ancient church of Kilcarn, near Navan, in the county of Meath. Placed upon its shaft, as represented in the cut, it measures in height about three feet six inches; the basin is two feet ten inches in diameter, and thirteen inches deep. The heads of the niches, twelve in number, with which its sides are carved, are enriched with foliage of a graceful but uniform character, and the miniature buttresses which separate the niches were decorated with crockets, the bases resting upon heads, grotesque animals, or human figures, carved as brackets. The figures within the niches are executed with a wonderful degree of care, the drapery being represented with each minute crease or fold well expressed. They were evidently intended to represent Christ, the Virgin Mary, and the twelve Apostles. All the figures are seated Our Saviour, crowned as a king, and holding in his hand the globe and cross, is in the act of blessing the Virgin, who also is crowned, the "Queen of Heaven." The figures of most of the Apostles can easily be identified: Saint Peter, by his key; Saint Andrew, by his cross of peculiar shape; and so on. They are represented barefooted, and each holds a book in one hand. 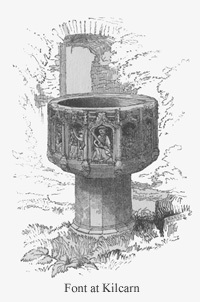 The font does not now rest upon its ancient shaft, nor has it done so in the memory of the old people of the neighbouring village; but the shaft still remains within the church, and the whole might be easily restored. A font almost precisely similar in design may be seen in the choir of the ruined church of Dunsany, near Dunshaughlin, in the same county, but it is of smaller size, and the figures and ornaments with which it is sculptured are less prominent than those upon the example at Kilcarn. A fine and unusually large font remains in Christ Church Cathedral, Dublin, and in several churches to which we have referred the reader interesting specimens occur.